French playwright; born at Paris April 18, 1840. Educated for a commercial career, he was engaged in business for more than twelve years, when, in 1869, he abandoned it for music. In the Franco-Prussian war he saw active service as a volunteer in the Breton legion formed in Rennes, becoming second lieutenant. From 1872 to 1888 he was editor of the "Revue et Gazette Musicale," and since then he has been engaged in journalistic work, writing for the "Voltaire," "L'Evènement," and "L'Illustration." He was made a member of the Legion of Honor in 1886. 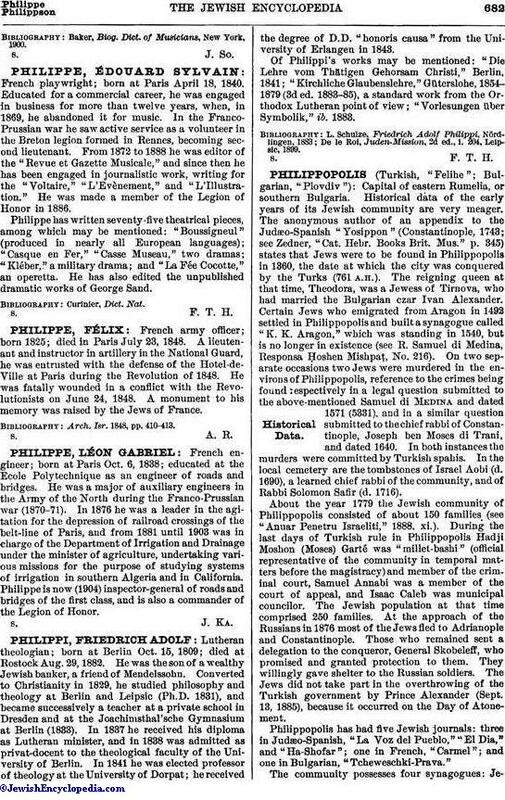 Philippe has written seventy-five theatrical pieces, among which may be mentioned: "Boussigneul" (produced in nearly all European languages); "Casque en Fer," "Casse Museau," two dramas; "Kléber," a military drama; and "La Fée Cocotte," an operetta. He has also edited the unpublished dramatic works of George Sand.